Well we love the Puerto Vallarta zoo. First, it is about a five minute walk from our hotel gate. At the zoo entrance, you can buy feed bags (at a very reasonable 50 pesos each), and then it is off to the tour to see and interact with all the lovely creatures. You can also pet many of the animals, and some of them run loose like the plump and noisy geese. Of all the zoos we have visited this one allows us to be the closest to the animals we see. The zoo feedbags contain carrots, dry bread, pellets, peanuts and corn. We fed monkeys, rabbits, geese, flamingoes, gazelle, ostrich, guinea pigs, mountain goats, deers, toucans, raccoons, ponies, and a dromedary. And I am sure I left something out. Lili feeding the very friendly giraffe. This dromedary was very gentle as well. There are also farm animals, like these very large pigs. And here is a highlight of the morning - Lili got to hold a one month old baby jaguar. It was cute beyond words! 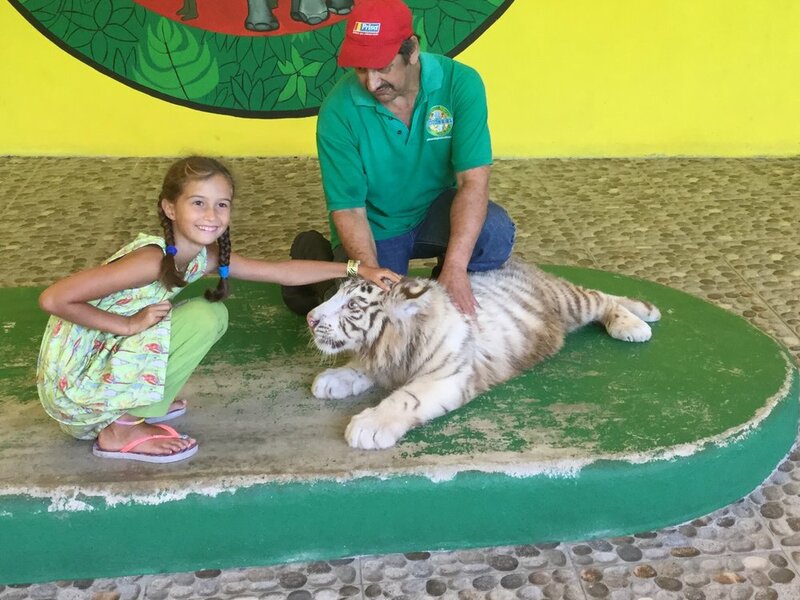 Here Lili is interacting with a Siberian tiger cub.